It’s become something of an April tradition: Shortly after Apple sends out the WWDC invitation, we all start trying to figure out what Tim Cook might be hiding up his sleeve. Like an optical illusion or a poorly-lit dress, we each interpret the conference logo and tagline in our own way, and by the time the keynote actually arrives, it’s been deconstructed to the point of absurdity. But our guesses are most often wrong. Last year’s invite, for instance, with its rounded square motif and “Epicenter of change” teaser, seemed to clearly point to an overdue Apple TV refresh that opened up the platform to developers and paved the way for a subscription TV service. Instead we got Apple Music and the News app. This year, we have something a little different to chew on. While there isn’t too much to decipher on the invite—the design theme is Swift coding and the language contains thinly veiled references to popular third-party apps—Apple gave us a juicy hint even before the emails were even set out. Earlier in the day, Siri was blabbing about the WWDC dates to anyone who asked, giving the digital assistant a rare opportunity to scoop its maker. 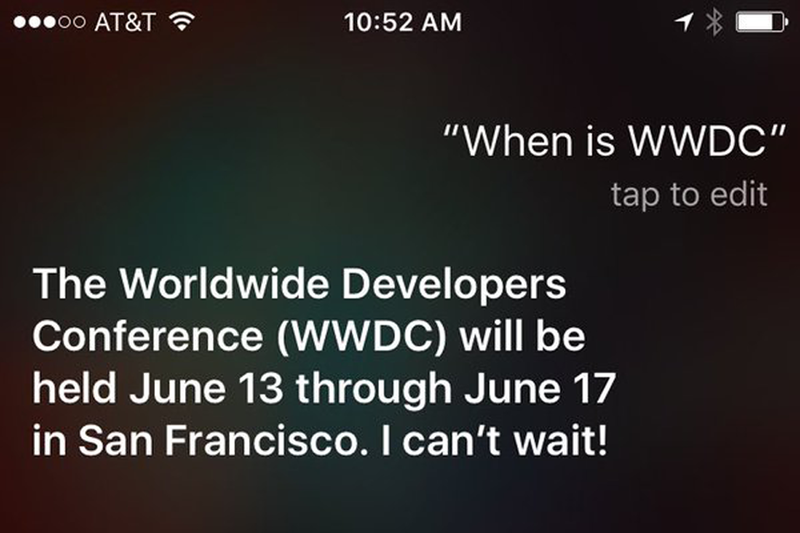 And I think it’s safe that Siri’s role in WWDC isn’t going to be limited to her loose lips. Over the past year or so, Siri has taken on much more responsibility. On Apple Watch and Apple TV, it plays a major role in not just with intelligence but also navigation, and on the iPhone 6s, the always-on Hey Siri has given Apple’s digital assistant life beyond the limitations of its handset confines. But for all of its advancements, Siri is, for the most part, still a novelty. While the voice recognition technology has been refined with each new device, there are still many instances where Siri is either too slow or doesn’t have the right information, and it’s just easier to perform tasks the old-fashioned way. If Apple wants Siri to be a central part of the experience, speed and efficiency are of utmost importance. But still, while Siri may be lagging a bit behind Google Now and Cortana, the race to build the perfect smartphone AI is still a close one, and I think this year’s WWDC is going to be a breakout moment. Letting Siri leak the dates might have been a cute gimmick (one reminiscent of the teaser to last year’s iPhone event, “Hey Siri give us a hint,” which elicited a series of playful interactions when the knowledge navigator was queried), but I also think it’s a sign that Apple is going to finally let Siri loose to take on a much bigger role in the ecosystem. Apple has thus far kept a tight rein on Siri, locking it down to system functions and stock apps. But on Apple TV, Apple has opened it up a bit, letting some content providers access the voice-powered universal search and most recently enabling Live Tune-In, which gives Siri the power to access third-party apps. A similar implementation on iOS or watchOS would instantly make Siri an instant killer feature. The WWDC scoop might even be a little taste of what we’ll be able to do with a new Siri API; a full-blown in-app API might not be in the cards just yet, but opening data queries may very well be. By letting Siri retrieve information from the dozens of other apps we have installed, it would become exponentially smarter while also cutting down on the number of times we need to unlock our iPhones. Siri on iOS has had the ability to launch apps since iOS 6, but the functionality doesn’t go beyond replicating the simple act of tapping on the home screen icon. Siri on Apple TV is much smarter. When you say “Watch ESPN,” it doesn’t just open the ESPN app; it takes you straight to the live feed for a totally tap-less viewing experience. Being able to open a specific appointment in Fantastical or jump to a location in Dark Sky without using our fingers would certainly be a useful feature in iOS 10. The biggest impediment to Siri’s usefulness isn’t the lack of a third-party API, it’s the disparate methods we use to summon her. Hey Siri is the easiest method, but it’s missing from the one device where it would be most useful. Siri on Apple TV is fantastic, but the way we need to activate it is not. Holding down the button during the whole conversation is in opposition to how we do it on our other devices, and the lack of a Siri button on the Remote app is a major nuisance. Eddie Cue has already promised that a new app with “the full functionality of the Siri Remote” due this year, so our struggles seem likely to end at WWDC. Even beyond a functional iPhone app, however, Hey Siri would be perfect for Apple TV. With Alexa and Echo, Amazon has already demonstrated just how useful an always-on digital assistant can be in our homes, and all the pieces are there for Apple to build a similar set-up with its digital media receiver. And it would solve the problem of bringing Siri to the Mac as well. It’s not entirely clear why Apple has waited so long to bring Siri to its computers, but activation is surely one of the issues Apple is wrestling with. Adding a menu bar item alongside Spotlight’s magnifying glass is fairly obvious, but for quick queries, a key stroke might not do the trick. (After all, how many casual users know the Command-space bar shortcut to access Spotlight?) But voice activation would work well, letting us summon Siri without needing to stop whatever we’re doing. Siri has come a long way since its beta beginnings, but in many ways its still an immature system. But I think a growth spurt is coming at WWDC. It could be why she’s so excited for this year’s event. « You've been hit with ransomware. Now what?